AT the 2015 Palm and Lauric Oils Price Outlook Conference & Exhibition held in Kuala Lumpur last week, analysts’ yearly prediction of palm oil’s price direction turned out to be one of the gloomiest in years. The overwhelmingly weak demand in spite of bullish supply figures is set to cap the commodity’s upside and may even see it trading at levels not seen since the global financial crisis of 2008/09 — RM1,800 per metric ton. While the crisis saw crude palm oil (CPO) prices fall below RM2,000 — in tandem with a collapse in global commodity prices — this time around it would be due to highly unfavourable underlying fundamentals. The analysts’ bearish medium-term forecasts, however, were in stark contrast to current CPO prices. On March 4, the benchmark three-month forward contract for CPO (June 2015) peaked at RM2,375 due to the seasonally weak production period early in the year. 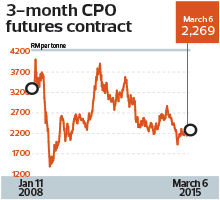 Settlement prices for CPO were at RM2,360.50 the same day — close to a seven-month high. Still, the palm oil experts noted that despite a short-term reduction in stocks and a proactive biodiesel mandate in Indonesia and Malaysia, the upside potential for CPO prices was capped. James Fry, who is chairman of LMC International Ltd, predicted that crude palm oil futures settlement prices could go as low as RM1,770 by the second half of this year (2H2015). According to him, palm oil stocks will start to build up again by mid-year and will continue to grow unless there is a huge increase in demand for palm methyl ester (PME) from the biodiesel segment. “While Malaysia’s palm oil stocks could fall below 1.6 million tonnes by the second quarter, they could rise all the way to 2.5 million tonnes in future quarters unless discretionary PME sales become viable or a dramatic policy switch boosts local sales,” said Fry in his presentation at the conference. Neither situation is highly likely at the present time. Diesel prices remain at a steep discount to biodiesel while the government’s push for mandatory B10 implementation is set to be delayed for at least another year. Furthermore, Fry said, current futures prices for the two commodities indicate that the forward CPO premium to Brent is too high for biodiesel sales, especially with the added U$188 in processing costs under Indonesia’s mandate. “If you look at the futures contracts for January 2017, there is still a premium of U$100, which means discretionary demand is impossible based on present prices and structure,” he added. Assuming Brent crude oil at U$60 per barrel, Fry believes CPO’s upside will be capped at RM2,260 by 1H2015 while an expected growth in output would see it go down to RM1,770 by 2H2015. At such a low price point, upstream players will see their profit margin from CPO sales erode to multi-year lows. And assuming that Brent crude remains at present levels, negative refining margins for biodiesel producers will widen, putting pressure on governments to continue subsidising the industry. Godrej International Ltd director Dorab Mistry was sceptical about Indonesia’s ability to carry out its biodiesel mandate this year after a largely disappointing 2014. Last month, the country announced a hike in its biodiesel subsidy to IDR4,000 per litre from IDR1,500 per litre to incentivise producers. “Since November, state-owned Pertamina has not bought a drop of palm biodiesel while discretionary blending demand has nosedived to zero. Despite the government announcing a new subsidy scheme, we are still unsure about the quantity that is going to be subsidised,” Mistry said at the conference. He cautioned that Indonesia had a history of over-promising and under-delivering. He reckoned that as a result, domestic biodiesel consumption will be between 1.5 million and 2 million tonnes of CPO this year as opposed to the government’s projection of 2.8 million tonnes. He forecast CPO price to average RM2,300 this year. Apart from biodiesel being the swing factor in CPO’s price stability this year, Mistry explained that a move to lower the CPO export tax threshold in Indonesia and Malaysia will be highly beneficial to the commodity. In Malaysia, the current threshold is RM2,250. “Export taxes will improve the refining margins of local downstream players. Secondly, the revenue can be used by the governments to subsidise the consumption of palm biodiesel locally. To a large extent, export taxes will help raise world CPO prices,” said Mistry. Meanwhile, the oversupply of soybean is set to dampen edible oil prices for the second year running, given the excess inventory in countries such as Argentina and the US. Imports by China and the EU — normally palm oil’s biggest export destinations — have slowed down considerably this year due to the abundance of cheaper soyoil. According to International Statistical Agricultural Information Mielke GmbH executive director Thomas Mielke, world stocks of soybeans will likely rise to an all-time high of 89 million tonnes at the end of the 2014/15. “World production of all the 17 oils and fats has doubled in a relatively short time on the back of a previous biodiesel boom, thanks largely to marginal producers. But now, we are losing these producers as vegetable oil prices have fallen to unsustainable levels. Overall, we may be looking at a longer period of surplus stocks and depressed prices,” he said at the conference. The experts also agreed that the historical correlation between crude oil and CPO prices no longer applies — the decoupling occurred in November last year following Brent’s 40% decline. Mielke pointed out that this would result in a better price recovery for CPO as it was now influenced more by demand and supply fundamentals.